This website has a lot of free resources for teachers and students , from lesson plans to interactive grammar games and tools. 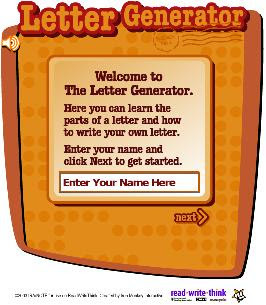 I have chosen one of the lesson plans because is especially useful for my students worried these days by the Selectivity Exam ( University entry test in Spain)This is the Letter Generator, as they say : "The Letter Generator is a useful tool for students to learn the parts of a business or friendly letter and then compose and print letters for both styles of correspondence." These resources are provided by ReadWriteThink.org, a website developed by the International Reading Association, the National Council of Teachers of English, with support from the Verizon Foundation. Click here to go to read write think.